This was written by admin. Posted on Thursday, April 11, 2019, at 1:48 pm. Filed under Uncategorized. Bookmark the permalink. Follow comments here with the RSS feed. Post a comment or leave a trackback. Nj.com has article about possible beach closing at marina. 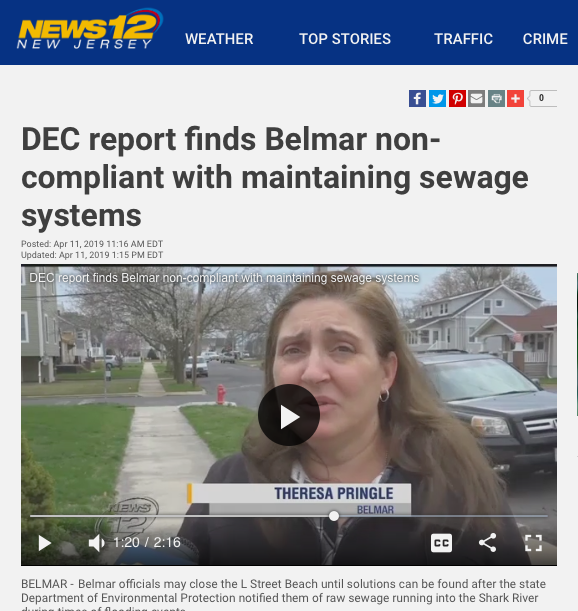 Belmar residents were bamboozled by Dirty Doherty urgently paying 4.5 million dollars for the Middlesex Catering Hall on Ocean Avenue post Superstorm Sandy instead of immediately fixing life threatening sewerage leakages from Rhode Island Point leaking pipes. L Street Long term exposure to effluent must be cured. Where’s the DEP now? Now it will be fixed !!! Past administration was drop dead stupid. Wasting money on lawyers and lawsuit payouts.